The Anco Lands portfolio consists of 10 unique parcels, six of which are under contract and four remain available for sale. The remaining parcels range in size from 40 to 277 acres and total approximately 461 acres. 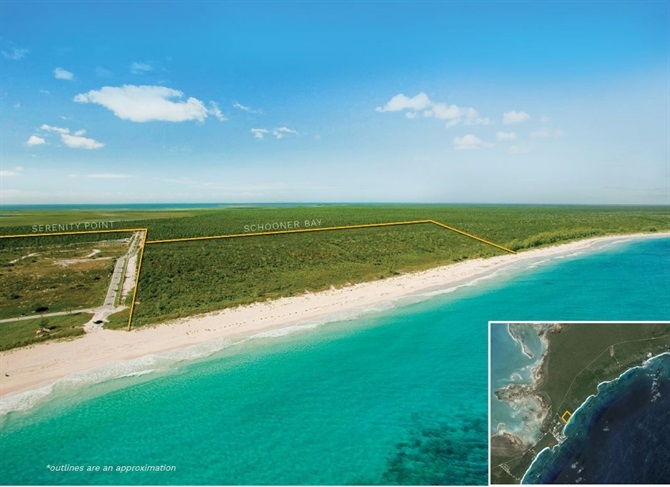 Originally acquired by Canadian industrialist and inventor Alexis Nihon, the portfolio includes world-class beachfront land and some of the highest elevations in Abaco, suitable for commercial, residential and marina uses. Collectively, the six available parcels represent excellent opportunities for development or a long-term land bank that will appreciate considerably over time. Two of the available properties are located in a high-growth area just north of the capital city of Marsh Harbour near Red Bay Marina Village where the recently completed marina now serves as a hub for Abaco’s exclusive ferry service, Albury’s Ferry Service. The two available oceanfront parcels at Schooner Bay share one of the world's best beaches and are situated adjacent to the existing marina and resort community at Schooner Bay Village. The Commonwealth of the Bahamas is one of the richest countries in the Americas with a strong reputation as a safe location for investment supported by enduring political stability. Investment incentives are offered by the Government and no taxes levied on capital gains, corporate earnings, personal income, inheritance or dividends. Known as the “Sailing Capital of the World,” Great Abaco is the fastest growing island in the Bahamas, with its largest second home market and the most trafficked airport outside of Nassau. The island enjoys low crime, stunning natural attractions and substantial government infrastructure. One of the largest and most developed islands in the Bahamas, a major airport renovation, new hospital, paved roads, government buildings, commercial marina, agricultural investment and a power plant have all been constructed in the last seven years. Great Abaco and Little Abaco serve as the "mainland," with the a series of cays a few miles offshore creating the protected Sea of Abaco. 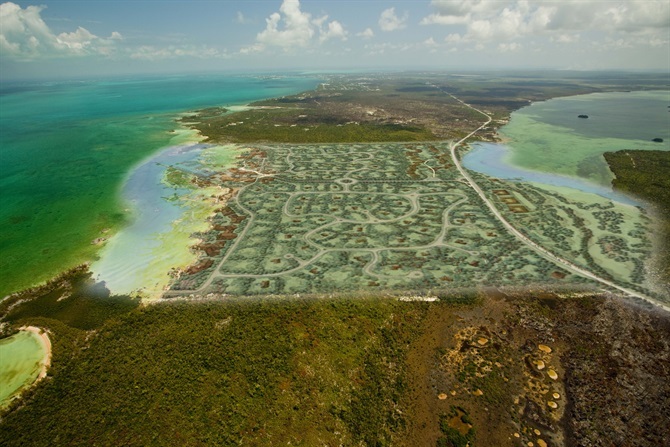 Successful developments in the Abacos include Treasure Cay, Abaco Beach Club, Abaco Club on Winding Bay and arguably the most successful development in the Bahamas, Baker's Bay Golf & Ocean Club on Great Guana Cay. The Schooner Bay parcel is a prime, 80-acre site ideally located on the spectacular beach at Schooner Bay in a steadily developing region. This is one of Abaco’s finest beachfront properties and features 1,850 feet of pristine beach frontage and gentle elevations of over 75 feet, with all utilities available. Situated in the narrowest southern region of Abaco, the property’s elevations offer stunning views of both the eastern and western coastlines. Available at the property’s border are fiber optic cable, a six-inch city water line and high-tension electrical service via a newly built substation with substantial capacity remaining for large-scale development. Rated “phenomenal” by Condé Nast Traveler Magazine, the beach at Schooner Bay is 25 miles south of Marsh Harbour and features more than two miles of powder soft sand, with a large bay and an elevated ridgeline. The 80-acre Schooner Bay parcel borders a 40-acre planned residential community to the south, known as Serenity Point (also owned by Anco Lands). Adjacent to the Serenity Point parcel (but not part of this listing) is Schooner Bay Village, a 320-acre community built around a 14-acre harbor and marina. $100 million has been spent to date on improvements including the Sandpiper Inn, Blackfly (fishing) Lodge, organic farm, medical clinic, school, offices of the Bahamas National Trust, boat storage, sports fields, 40 homes and various resort amenities. Serenity Point is a private, 40-acre planned community on beautiful Schooner Bay, 25 miles south of Marsh Harbour with extraordinary ocean views to both the east and west. More than $6 million has been spent on infrastructure and planning at Serenity Point, which features 815 feet of beach frontage and 70 feet of elevation. 46 homes are planned, including beachfront and elevated estates. Existing utilities include city water, a fiber optic network and an electrical substation. Watch a video here! The 277-acre Summit Point parcel is located six miles north of Marsh Harbour. 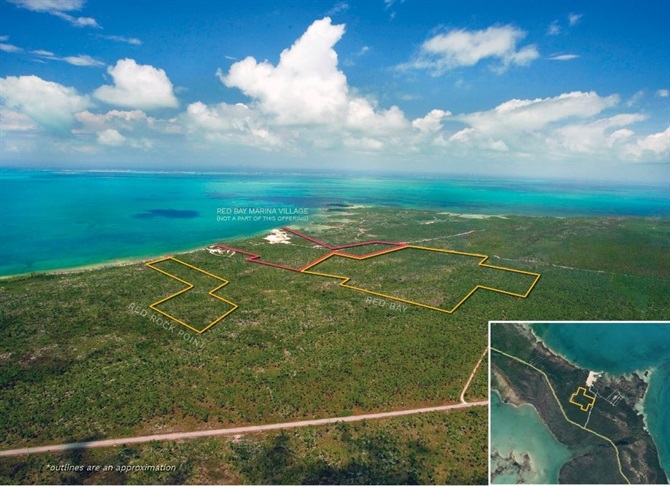 This one-of-a-kind property is situated on the highest point in all of Abaco, with elevations reaching 120 feet. Also occupying one of the narrowest points of the island, the 360-degree views from these heights are spectacular and the property’s extensive beach frontage includes 4,000 feet on the Sea of Abaco, plus 2,000 feet of shoreline on Bustick Bight Bay. 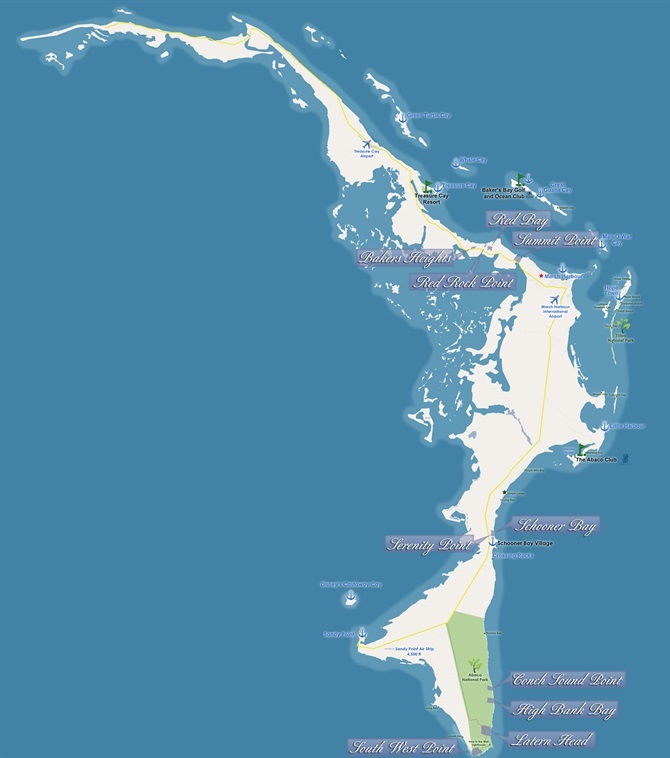 Marsh Harbour is six miles south and Treasure Cay is 12 miles north. 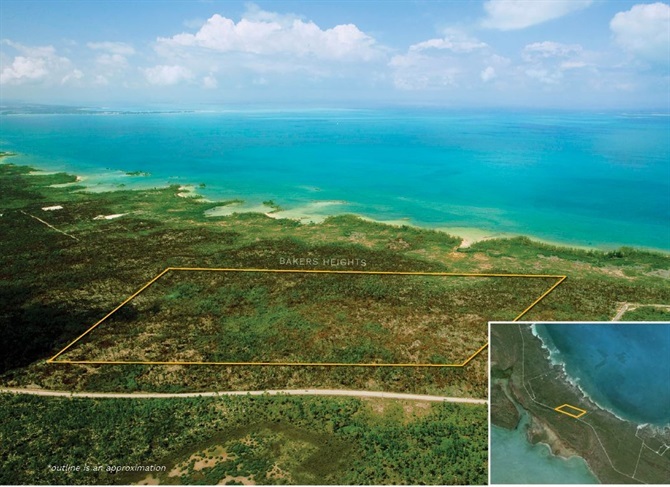 Bakers Heights is a rectangular, 64-acre tract located 10 miles north of Marsh Harbour and eight miles southeast of Treasure Cay. Set back 200 feet and running parallel to the Great Abaco Highway for a distance of 2,700 feet, the property features rolling hills with 80-foot elevations providing stunning views of the Sea of Abaco. Utilities are available at the highway, within 200 feet. The new Red Bay Marina development with ferry service is less than two miles south of Bakers Heights. 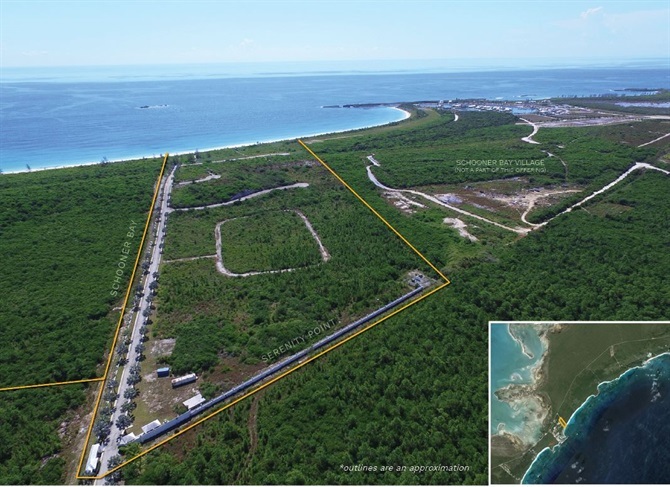 Northern Abaco has experienced significant residential construction in recent years, with several middle and mid-tier developments rapidly absorbed. Two residential developments are currently under construction two miles southeast of Baker’s Heights, one of which will include a marina that will serve as the new hub for Abaco’s exclusive ferry service, Albury’s Ferry service. The 67-acre, mixed-use property will feature a commercial marina that will serve as the new ferry headquarters. Plans call for two terminals, one for Albury’s and one exclusively for owners and guests of Baker’s Bay Golf & Ocean Club on Great Guana Cay. It is anticipated that a minimum of 1,000 people a day will utilize the ferry service. Additional plans include a boutique hotel, retail center and residential housing. With the ferry’s relocation from Marsh Harbour and other ongoing development, the Red Bay area is poised for significant further development. 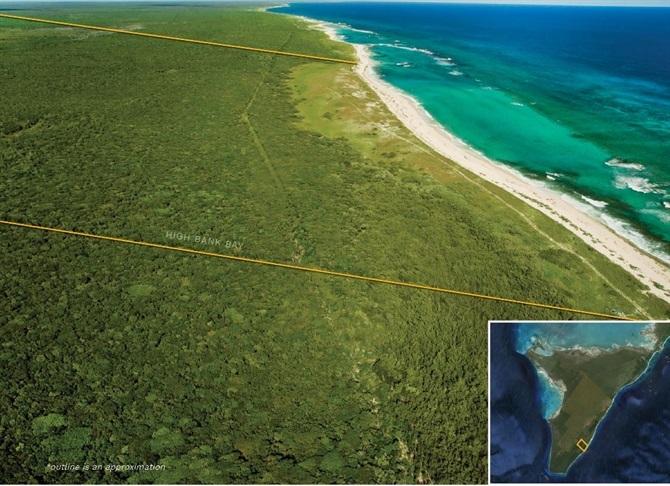 The 106-acre Red Bay parcel is located eight miles northwest of Marsh Harbour and less than 1,000 feet from the Great Abaco Highway. The site has gently rolling topography with elevations reaching 60 feet, and runs parallel to a private road for a length of 2,100 feet. The property includes easement access to an attractive beach at the nearby Red Bay coastline. Utilities are available at the highway. Anco Lands also holds a 27-acre tract of land with beach frontage at Red Rock Point, situated immediately northeast of the property, adjacent to the aforementioned developments. Both properties are a ten minute drive from Marsh Harbour International Airport. The 27-acre Red Rock Point parcel is located approximately eight miles northwest of Marsh Harbour. The property features 440 feet of fine beach frontage along the Sea of Abaco and gently upward sloping topography that rises to 20 feet. Utilities are present at the Great Abaco Highway, one mile southwest via a road reservation. Anco Lands also holds Red Bay, a 106-acre tract of land situated immediately southwest of the property, behind the aforementioned marina development. Both properties are a ten minute drive from Marsh Harbour International Airport. 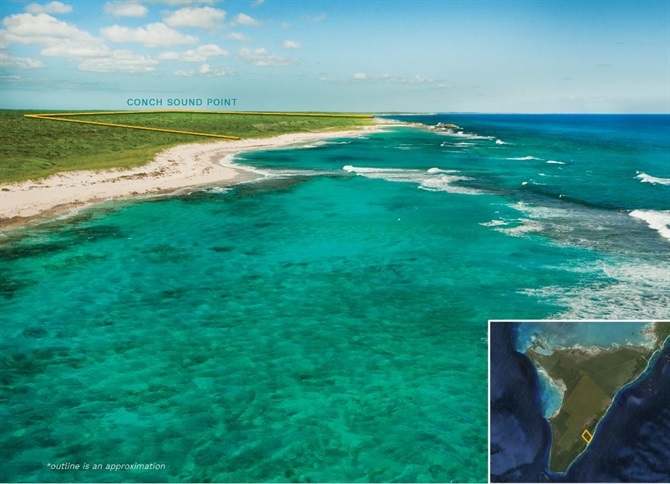 Conch Sound Point is an 76-acre coastline parcel that is contiguous with the Abaco National Park, 35 miles south of Marsh Harbour. With a magnificent, high-end beach and small coves nestled around natural rock formations, 40-foot elevations offer ideal views of gin-clear water. The beach features a unique barrier reef just offshore and in some cases as close as 80 feet, providing a sheltered swimming environment. 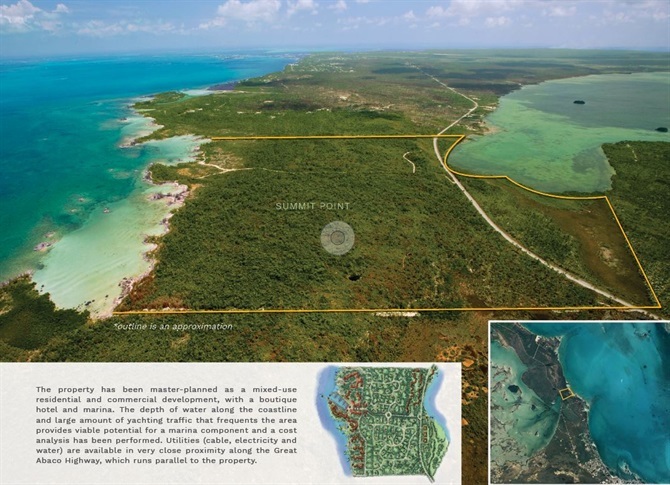 A 60-foot road fronts the property, providing access to the Great Abaco Highway. The 103-acre High Bank Bay parcel is located 40 miles south of Marsh Harbour and features a spectacular, high-end beach along with gently rolling elevations of 40 feet. Road access runs through the 20,000-acre Abaco National Park and is interconnected to the Great Abaco Highway. 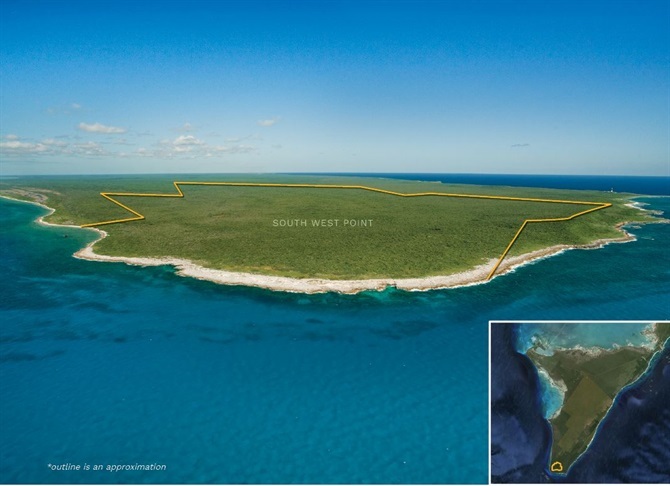 This property forms part of the narrow band of coastal land in South Abaco that is privately owned and available for development, with much of the balance preserved in the 20,000-acre National Park. The town of Sandy Point is roughly 18 miles to and is served by a 4,500 foot air strip, as well as regular ferry service to Nassau. The 609-acre Lantern Head parcel is situated 45 miles south of Marsh Harbour, within view of the well-known Hole-in-the-Wall Lighthouse. The shoreline includes a dramatic high cliff, ranging from 60 to 100 feet above sea level, as well as a pristine beach and cove. Elevations top 100 feet, while shoreline frontage runs 5,400 feet. A 100-foot pubic road runs across the property and connects directly to the Great Abaco Highway. 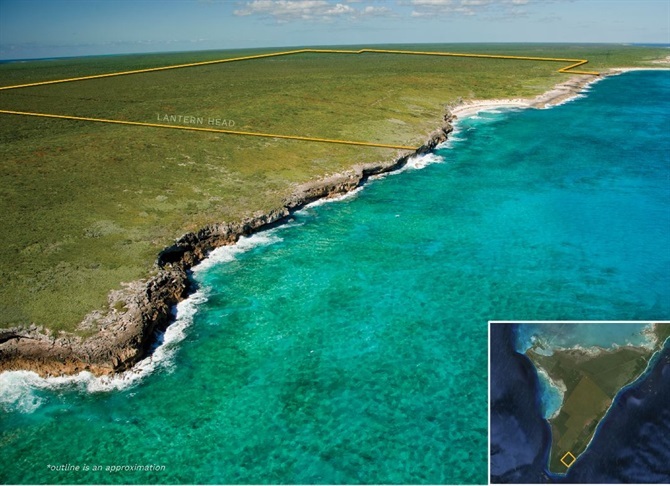 The 467-acre South West Point parcel occupies the southwestern tip of Great Abaco and features rolling topography between 20 and 40 feet, with a dramatic ridge as high as 80 feet. Shoreline frontage runs 5,140 feet and beaches are in close proximity at the old settlement of Alexandria. The western portion of the property includes a viable marina location. A public road provides access to the property and connects to the Abaco Highway.